Come away from the maddening crowd to Praia Sao Rafael, one of the more secluded beaches with fine, silky sand serenaded by golden, limestone cliffs that arc over the waters to form little coves. 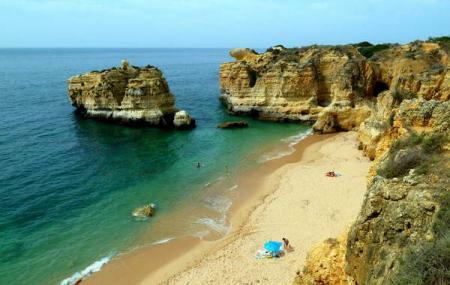 Located about 4km west of the town of Albufeira, the beach has a lot of limestone rock formations on the beach itself, a result of years of corrosion that have resulted in fascinating shapes. Some popular ones are Ninho das Andorinhas or the Swallow’s Nest and Ponte Pequena or the Small Bridge. The waters are azure and very cold in the middle of the year, and makes for a great chilly dip with some teeth-chattering in the gorgeous Portugese sun. Lifeguards patrol the beach during summer and even at its seasonal peak, you are sure to find a quiet cove around the beach for some downtime. This beach is accredited with good facilities for the disabled, having boardwalks and paved areas from the nearby parking lot. The beach has good facilities like clean toilets and public showers. Loungers, parasols and Pedalo's can be hired. There is a car park at the back of the beach, some of which are for disabled drivers displaying a European blue badge. It can get quite crowded in the summers so arrive early to find parking space, as a restricted number of vehicles are allowed parking here. You can take a bus from Albufeira to reach Praia Sao Rafael. How popular is Praia Sao Rafael? People normally club together Zoo Marine Algarve and Montechoro Strip while planning their visit to Praia Sao Rafael. Amazing beach!! There is also a restaurant that is open during the summer. Quite private with a small cove that leads to secluded side as well. In detail Rooms: Bedding- Super comfy! Pillows are soft, put me to sleep right away! Washroom- Large and separated shower in one unit toilet in another. Coffee- Strange situation, 2 espresso pods are provided for free, anything after is 2 Euros extra. Regular coffee and teas are available in the cabinet along with the mini-fridge Common areas Lobby- Very large, great seating area for waiting Staff are friendly and knowledgeable Gym/spa/pool- As mentioned before 6:30 close Spa seems nice, private hot tub and relaxation area. Gym has some great machines, a big empty space in the middle for floor exercises. Pool is nice and warm. However, they want you to get a swimming cap to enter the pool. Restaurant Breakfast buffet is great cold to hot meals Lunch and dinner service also available Outside Patio, pool, bar Available for the summer Side notes: Tide comes in early around 6 Low season- January - April High season- June - September The beach can be somewhat difficult to get to. Takes about 10 minutes door to sand. There are cliff sides to walk, but be careful hike at own risk! Beautiful beach with stunning views! There are lots of trails around the beach on the surrounding cliffs that allow you to get fantastic photos and an overhead view of the beach and ocean.The beach is self is very well kept and the sand is really nice on your feet. Would recommend to anyone who is in Albufeira to come to See Rafael beach to the true beauty of this area! Nice secluded beach with soft fine sand and access to the sea. It's not a big beach so it can get quite busy in the summer months but during March it is nice and quiet. There is a bar/restaurant open during high season. There are some fantastic views from the rocks and paths at the top of the beach. The only downside is the slope going down to the beach - it's cobblestones and quite steep so be careful if you've got a pram or wheelchair or any other wheeled items. Great beach experience, the water is a little chilly and not too clear. The sea caves are really cool. Also, you can hike from there all along the cliffs to many little coves and beaches. Watch out for snakes though. Great beach with free parking. Plenty of spaces to park and not to far to walk to the beach. Nice sand and rock formations.